A private UK fertility clinic is offering couples a new form of IVF treatment that lets conception occur in the womb rather than in the lab. Doctors hope that making fertilisation more natural will mean healthier pregnancies. The Complete Fertility clinic in Southampton is first in the UK to use the AneVivo device method. 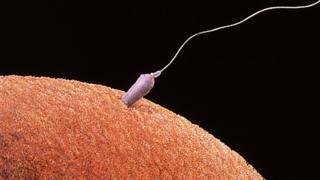 It is a tiny tubular capsule that is loaded with the sperm and egg before being placed into the uterus. Prof Nick Macklon, head of the clinic, insisted it was not a gimmick. He told the BBC: "At this stage we are just offering it to private patients. If the NHS want to use it then they would need to know that it is cost effective. We do not know that yet. "But that doesn't mean new technology like this can't be introduced in a cautious manner. I'm very keen that we study new innovation in IVF." The technique, which costs around £700 per go, has been approved by the UK's fertility watchdog, the HFEA. International trials in around 250 women suggest that it achieves a similar pregnancy rate to conventional IVF, says Prof Macklon. But it reduces how long the growing embryo is kept artificially outside of the womb in a dish of culture fluid. Prof Macklon said: "The aim is to maximise the time spent in the body rather than in the lab. The immediate benefit is reducing exposure at this very vulnerable time of human development when genes are being switched on and off." Some studies have suggested that growing embryos in a dish increases the risk of genetic and other health defects. It is not yet known whether the womb device will be an improvement. Although it allows fertilisation to occur within the body, the resulting embryo still needs to be removed and given a health check in the lab before being reimplanted (minus the device). When the HFEA approved the technology, its advisory committee said there was no evidence that the device would be ineffective or unsafe. However, it "did not feel that there was sufficient clinical data to say whether the process has a greater or lesser efficacy than that of traditional IVF methods" and it said the process "might add an unnecessary cost to patients". How has IVF developed since the first 'test-tube baby'?